How to register for Logsearch. 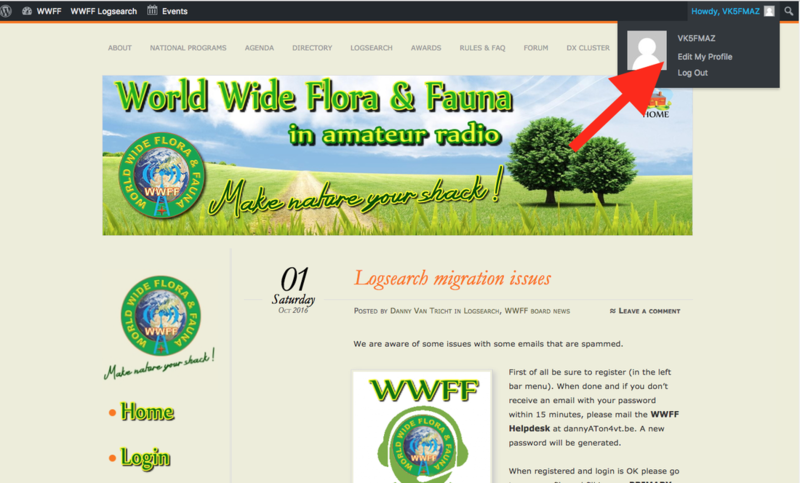 Here is a quick rundown on how to register for Logsearch with the World Wide Flora Fauna (WWFF) program. 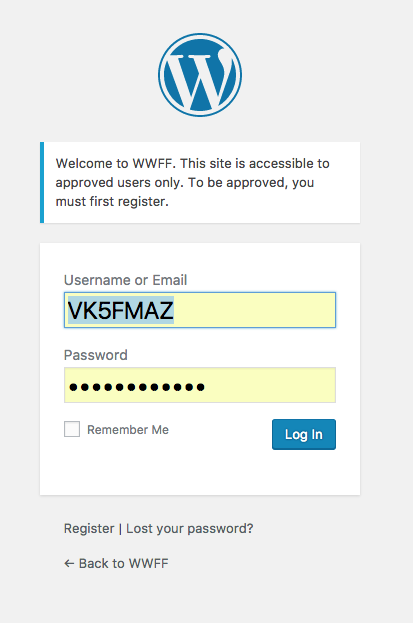 Logsearch is the electronic database for the WWFF program, where all activator logs are uploaded (by National co-ordinators), and from where activators and hunters can track their progress. 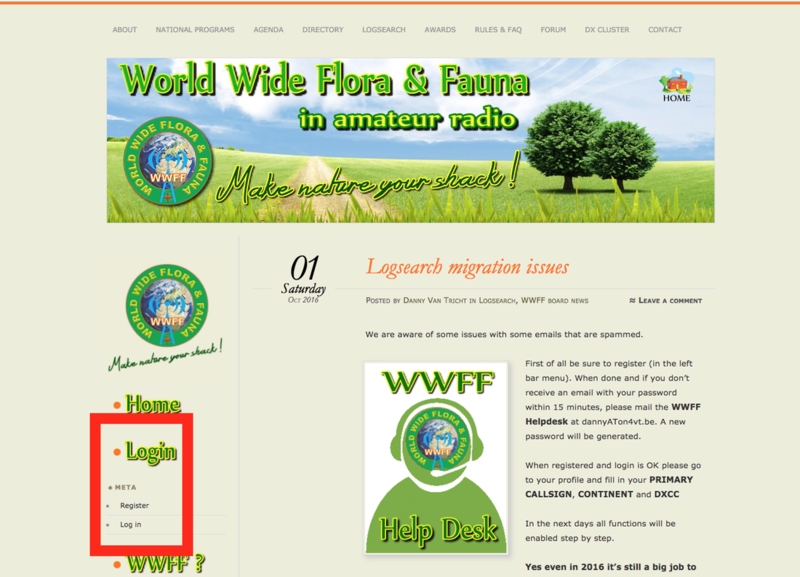 WWFF awards are also applied for on-line via WWFF Logsearch. Please note, that until the Activator log/s are uploaded to Logsearch, then the activators cannot claim the park, nor can any of the park hunters who worked the activator. 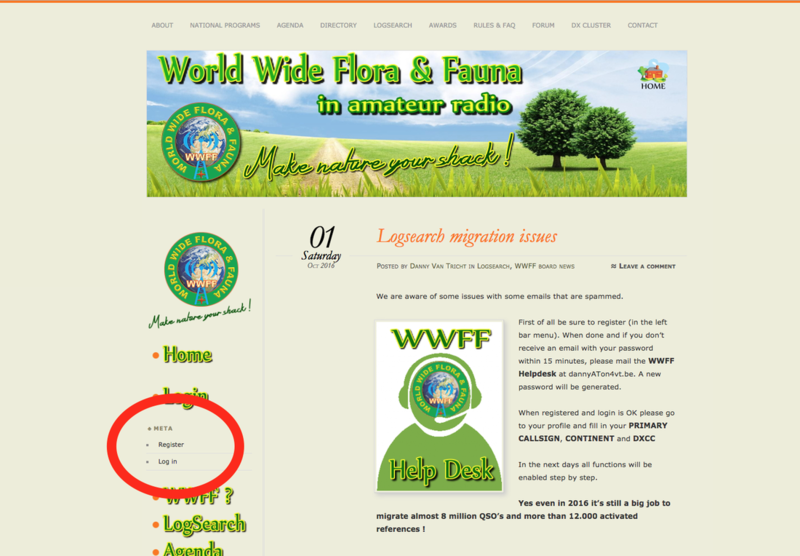 In September/October 2016, Logsearch was migrated over to the wwff.co website. It was previously located at http://logsearch.wwff.co/index.php. Please note that the old Logsearch site is no longer in use, and that you will NOT be able to use your old log in details on the new page. You will need to register. So how do I register to use Logsearch? This will take you to the page show below. 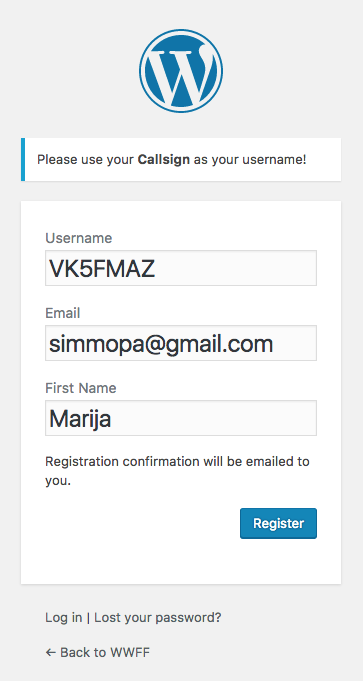 Enter your user name (Please use your call sign as your User name), your email address, and your first name. Then click on 'Register'. 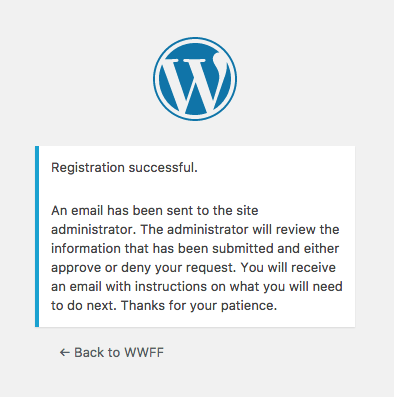 If you have registered successfully you will see the screen as shown below. ​As you can see, the message advises that an email has been sent to the Logsearch Administrator. They will review the information submitted and will either approve or deny your request. You will subsequently receive an email from the Administrator. 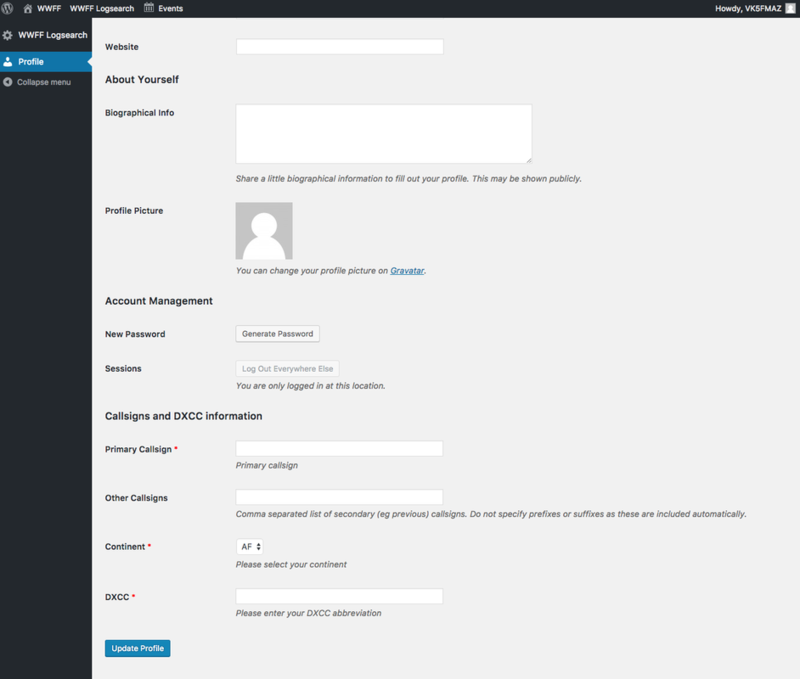 After clicking on 'Log in", you will be taken to the Log in Screen (as shown below). You can now Edit your Profile. Hover over your call sign and a drop down box will appear. Click on 'Edit My Profile'. 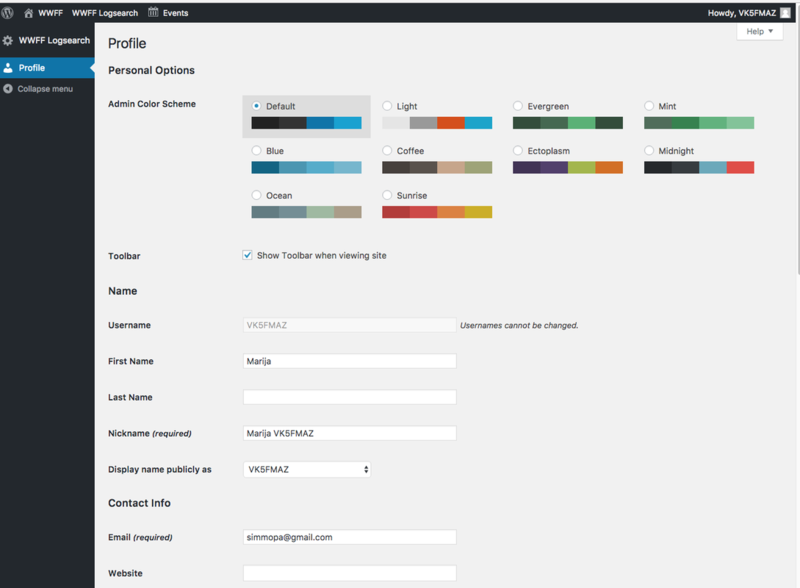 You can change or add information such as your last name and website. If you keep scrolling down, you will see that you are able to add some biographical information and a profile picture. You can also create a new password. In the primary call sign area, place your primary call. In the Other Callsigns box, you can place other call signs you hold, such as the AX prefix, e.g. AX5FMAZ. Separate any call signs with a comma. On this page you can also add your continent and DXCC entity.